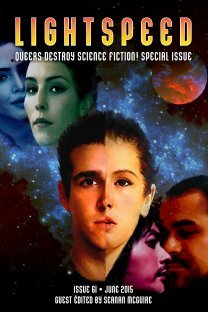 The special "Queers Destroy Science Fiction" issue of Lightspeed is out, and my story's in it! Along with a lot of other awesome stories! Check out "Bucket List Found in the Locker of Maddie Price, Age 14, Written Two Weeks Before the Great Uplifting of All Mankind" as part of the free content, or better yet buy the issue and unlock stories by Sarah Pinsker, Rose Lemberg, and many others. I really enjoyed "Emergency Repair" by Kate M. Galey, which you can also read for free. I've been having a hell of a time finishing stories lately. Over the past month I've started at least five different stories, three of which were variations on a single theme. Sometimes, no matter what you do, a story just won't gel and none of these were working. They were technically good, but felt lifeless. Protip: if your own stories seem lifeless to you, then they definitely will seem that way to an editor. So I started fresh. I reread a few stories that had inspired me in the past and were close to the tone I was trying to set down, figured out the narrator's voice, and just started writing. The new story has pieces in it lifted from the five different stories, but it's really its own thing. It's perhaps a little similar in theme to stuff I've already done, but hey, lots of writers run to similar themes (including some of my all-time favorites). I wrote 1700 words in the first session and plan to finish the story in a second session today or tomorrow, to achieve maximum freshness. I hope this story gels! I think it will. It feels like it will, even if I already see a whole laundry list of tweaks I'll need to tend to. Not really sure why I felt the need to document this. Perhaps it's just a way to keep myself honest?